A-frame banners are inexpensive and easy to assemble. We mainly print the banner onto black-white PVC and therefore they are attached to an aluminum frame with velcro strips. A-Frame Banner Printing options are the most affordable and therefore has the shortest turn-around time. The aluminum frames consist of 12 connecting poles that work in the same principle as an older gazebo. They are joined together with plastic connectors to form an A-shape structure. 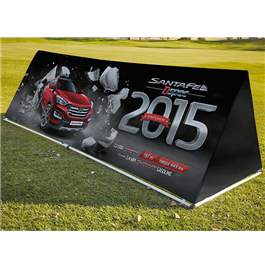 Our standard A-Frame Banner Printing are available in 1 m wide and 2/3/4 m lengths. A-Frame banners would be manufactured from lightweight and easy push-fit anodized aluminum sections. You have an option of displaying your banner landscape or portrait. If it is portrait you can have 3 banners on the unit and if landscape you can have 2 prints. The PVC banner is connected to the aluminum frame with Velcro strips. It takes less than 5 mins to set-up or take down an A-Frame banner. The A-Frame banner is ideal for indoor as well as outdoor use. In windy conditions, the banner could be anchored by normal tent pens on each corner (not included). The A-Frame banners come complete with a carry bag and are easily transported. Available in 1m x 2m or 1m x 3m. The A-Frame banner is a “must have” marketing tool for any marketing campaign. The A-Frame banner is one of the most versatile banners.